The KNAPHEIDE Group specialises in manufacturing hose-lines and fittings of all kinds for underground mining purposes, as well as other applications. Plus, the company offers engineering, production and assembly of customised electro-hydraulic control systems and parts. Worldwide clients in the mining industry have chosen KNAPHEIDE hose-lines and fittings for more than five decades, due to the quality, robustness and longevity of each product. In addition to the underground mining area, KNAPHEIDE’s extensive product range is also used by a broad array of customers from other fields such as excavating machines, concrete pumps, forklifts, and many others that require reliable and long-lasting hydraulic equipment. In order to ensure the highest level of quality and accuracy of its fittings, KNAPHEIDE counts on in-house production of almost all components of its lines, using the specialised affiliates within the group. KNAPHEIDE offers a wide selection of products especially for the mining industry. Apart from hydraulic hose-lines of all sizes, the company supplies a large field of up-to-date fittings and multiple control lines (‘multi-mini’) and complex, customised, hydraulic and electro-hydraulic control systems and related components. Development, design and construction of KNAPHEIDE products takes place in the headquarter´s facility in Beckum, Germany, as well as the sales, manufacturing and administrative tasks. The engineering centre consists of a group of highly qualified engineers and technicians who take care of everything customers request, supported by state-of-the-art equipment such as modern 3D CAD technology embedded in the group´s efficient enterprise resource planning (ERP) system, which all creates the fastest possible workflow steps to satisfy customer needs. In addition, online simulation guarantees a reduced development time for new products such as valves, valve blocks, piping systems, and special purpose hose-lines. 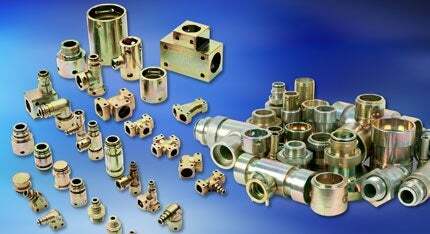 KNAPHEIDE manufactures all hydraulic components, such as fittings and adaptors, on more than 65 modern CNC-centres and lathes in Germany, in order to perform precision and top-quality work. The entire production process adheres to a quality management system certified according to the standard DIN EN ISO 9001. High standards in all manufacturing-steps are continuously being kept in order to get the specific products customers require in the quality requested. The daily output of the KNAPHEIDE group amounts up to 200,000 fittings and connections, respectively up to 50,000 hose-lines, which are sold to customers worldwide, among them the operators of the most renowned open-cut mines, and many OEMs of machines for the underground mining industry. KNAPHEIDE has been a reliable, innovative and efficient partner since the 1960s. Over the years, millions of standardised and internationally approved KNAPHEIDE parts have been and are still being used, including in sensitive environments. With approximately 800 employees and 30,000m² of work area, the group scores an annual turnover of approximately €150m. All activities are coordinated at and through the company headquarters in Beckum. KNAPHEIDE offers hydraulic hoses designed for industrial requirements.